She was born to the house of Maxis Ty as the first daughter and royal princess successor to the leadership of the clan. She must become a warrior with real battle experience to become a leader one day. The Feloid race has a long history of aiding jedi causes and in return the ruling class is taught how to build and use light sabers. In the new stuggle against the Empire Lionette has found the perfect war to prove herself. She is proud and regal in her demeanor and very seldom has time for fun. She has been given a specialy modified star fighter for this mission. It also serves as her home when other facilities are unavailable. She has a personal slave girl that is her constant companion named Timtam. She was a gift from her father on her sixteenth birthday and they are both very loyal to each other. Timtam was born into a wealthy clan’s slave house. The family went bankrupt and Timtam was sold off with all other belongings when she was still very young. During that time she had an accident that gave her amnesia and she has no memory of those past years until the age of fourteen when she was bought as a present for Lionette Ty. Timtam is fully devoted to her mistress and rarely questions any order or command no matter what it is. She considers herself lucky to be with Lionette and the clan of Maxis Ty. Kaboom! The speeder to the right of Timtam exploded showering bits of steel and burning plastic everywhere. “Stop lollygagging Timtam and get over here!” yelled Lionette. The bounty hunters had ambushed them over an hour ago. A simple moment of inattention had given the bounty hunters the opportunity they needed. Lionette popped up from behind the heavy guardrail and fired a quick burst from her assault laser at two of the bounty hunters hitting one in the leg. A grenade bounced across the hangar floor and directly into Timtam s lap. Timtam screamed and thrashed as if a huge Vendril spider had just landed on her. She scrambled and crawled across the floor scrapping her bare elbows and knees as blast after blast of laser fire just missed her. The explosion hurtled Timtam skyward, she was flailing her arms and legs hoping to grab something to slow her descent. She landed in a huge pile of garbage that had spilled from a trash collection bin that had been blown over earlier. The pink haired catgirl sat stunned for a moment and realized she was okay. Several blasts slammed into the bin reminding her of her situation. Hearing her mistress’s voice shook her to action. She rolled to a crouch and pushed off the floor. Her powerful legs propelling her forward. Like a Degobah jungle cat she quickly crossed the hangar floor leaping from cover to cover on all fours as her race can do in times when two legs aren’t fast enough. The bounty hunters try, as the might could not target her. Timtam had made it all the way across the hangar without being hit. Lionette, seeing that her opponents were momentarily distracted, slung her rifle on her back and using the plasticrete pillars leapt upward. Her claws easily sank into the pockmarked texture of the plasticrete and she nimbly leapt from one to the other back and forth until she had reached the upper level. Upon reaching the upper level a bounty hunter fired from behind her, but her years of combat training once again saved her. Lionette, still moving, flipped sideways in mid air and drew her light saber. 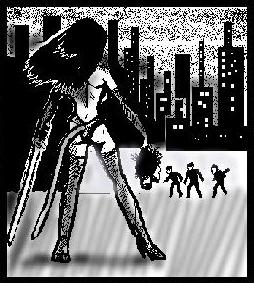 The shot had missed her.” My turn.” she said and landed in a crouch, immediately she launched herself forward and in one move decapitated the bounty hunter. Timtam had seen Lionette move to the upper level. She heard laser fire and the sound of a light saber strike then silence.” Nicely done my mistress.” she thought to herself. She saw two bounty hunters running towards a ladder that went to the upper level. If she only had a gun she could shoot them. But she was a slave and not allowed to even touch one. A glint of gold caught her sharp eyes,” The bracelet!” She was almost standing on it. Timtam bent down to pick it up when suddenly a huge blast from a ships exhaust blew the bracelet out of her grasp. “What now.” thought Lionette as she saw a gunship rising from the lower levels. With all the shooting she hadn’t noticed it’s approach. It was painted dark gray with yellow markings, it was an older model most likely some sort of war surplus but still in good shape. A huge Gamorian was standing in the side door of the craft as it slowly turned toward her. He was armed with a heavy blaster that he was now trying to aim at her. The ship was about ten meters away. The thrust was blowing her thick main in her face it was so close. As if in slow motion she charged the gunship light saber in hand. Most other races had heard stories of Feloid prowess in battle but few have ever actually witnessed it themselves. 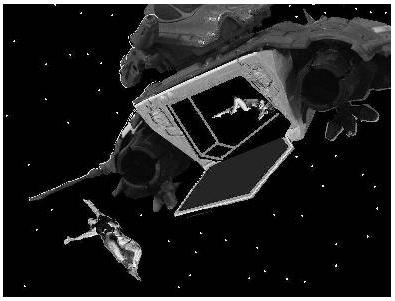 With a single leap Lionette had landed in the doorway of the gunship face to face with the Gamorian. Startled, The Gamorian took a step back. That was all Lionette needed. Her light saber thrust forward but not at the Gamorian. He looked at Lionette with a grin; These Feloids are not as good as he was led to believe. Before he could strike she had done a graceful back flip out the door and landed lightly on the pad below. The puzzled Gamorian took aim at Lionette. She was just standing there watching him with a mocking smile. Just then the gunship banked heavily and began to fall from the sky. The Gamorian looked around frantically only to see the thrust he thought was for him had killed the pilot. The Feloid had brought down the gunship with out a shot fired. 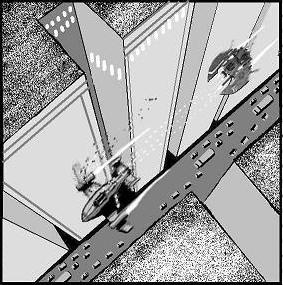 Timtam was still looking for the bracelet when she heard the crunch and banging of the gunship smashing off the railings of the landing pad as it slowly fell out of her view below into the lower levels, the engines still at full thrust. She quickly began to look for the bracelet again; she didn’t want her mistress to get angry. ” I found it!” Timtam shouted to herself.” If the mistress does beat me at least it won’t be that bad.” she thought. She carefully tucked the bracelet in her tiny outfit for safe keeping.” Mistress, Mistress, I found it! I found your bracelet!” Timtam called into the comlink. Lionette had by this time made it to the ship. The wounded bounty hunter was still taking pot shots at her whenever he could but she could tell he had very little fight left in him. Lionette opened the cockpit and jumped inside. She immediately checked the security protection systems and saw that no one had tampered with the ship. The engines kicked in with their usual pulsing hum that was so familiar to her. The ship gently lifted off the platform and she slowly turned it toward the control dome. Timtam ran easily across the lower level to the south end hardly noticing the burning wrecks and body’s strewn about. She had the bracelet and probably would not be beaten at all. At the southern edge of the platform Timtam waited for her mistresses ship to appear. She looked out over the city for the first time since they had arrived, it was huge. The Empire had just posted a garrison there so it was soon to become even more dangerous. However they were okay and they would soon be leaving. Just then Timtam heard an explosion from above and the debris from the control dome falling over the edge. One missile was all it took, and the control dome was no more.” Maybe I should have been merciful.” Lionette thought. “A ship to ship missile was a little over kill but that bounty hunter should have been dead anyway.” Lionette easily maneuvered the graceful ship down to the lower level. Timtam was waving like an excited child at Lionette as she drifted the ship backward to the platform and the little pink haired catgirl. Lionette could see Timtam ready to get in the open door in the rear of the ship. At once the combat training kicked in again. As if in slow motion she could see Tim tam’s expression go from happy to horror. Lionette, in a flash turned to see what Timtam was looking at. Three heavy fighters were diving and firing their guns at them. The ships shields clicked on automatically and took the full force of the barrage. Timtam, still outside the ship stood frozen, screaming as the laser blasts erupted all around her. “Jump!” was all that Lionette said as she nosed the ship straight down and hit the thrusters. Timtam didn’t remember jumping but found herself falling the same speed as their ship. She could see the open door just feet away but could not reach it. The ship was hit by another salvo from the fighters and rolled away from Timtam. Lionette was looking over her shoulder toward the open rear door and was yelling to Timtam to get in. 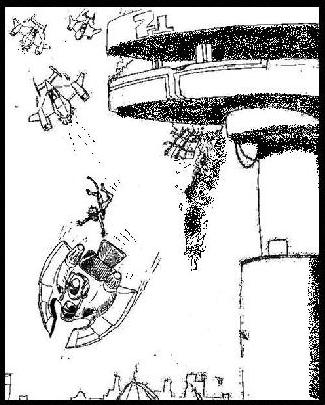 Timtam was now in complete free fall as both her and the ship drifted farther and farther apart. Timtam looked in horror and disbelief as the ship nosed up suddenly and kicked in its thrusters. The ship was gone. The wind rushing past Timtam was drowning out her screaming as she plummeted faster and faster. decide what to do next. Timtam was finding it hard to catch her breath as she fell. The wind was pushing against her so hard that she could barely exhale with each breath. Suddenly a flash of red went speeding past, it was the Blood Claw. The ship was in a dive about thirty meters below her. Lionette pressed a button opening the emergency drag chute. 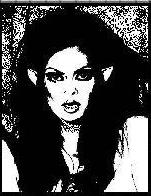 The ship lurched backward violently jamming Lionette forward in her restraints. Timtam was quickly engulfed in the huge drag chute and then hopelessly entangled in the shroud lines. She spun round and round in the tangle as the ship began to slow. Soon she was hanging like a fish in a net below the hovering ship. She struggled in the shroud lines until the ship was visible. It was the Blood Claw; her mistress had not left her to die in the fall. Just then, beyond all belief, she saw the chute being released. She began to fall all over again. Thunk! Timtam had only fallen about half a meter onto a rooftop some thousand meters below the towering landing platforms above. Timtam began to frantically search her body for the bracelet. Where was it? She was foraging deep in every hem of the skimpy slave attire. The Blood Claw rocketed skyward to finish off the remaining two fighters. She found it, she still had it. Timtam leapt to her feet and with the bracelet in her tiny hand thrust it skyward, I HAVE IT MY MISTRESS, I HAVE IT! !, She cried looking up as the ship was nearly gone from sight. Lionette did not respond to the voice in the communicator. The first daughter of Maxis Ty, clan leader of the Striking Paw clan had unfinished concerns awaiting above her. “You have proven yourself a worthy adversary today Lionette” the voice crackled on her communicator. The bounty hunters had accessed her communications system. “We have decided to let you live today, we will meet again.” The bounty hunters had given Lionette her life back today. But it is not for bounty hunting dogs to decide who lives and dies in the days of Lionette Ty, first daughter of Maxis Ty! “Come and join your ancestors you cowardly scum!” She roared into her commlink. The ship of a princess raced toward the retreating two fighters. Lionette linked in the turret guns mounted on the top of the ship to her own controls. 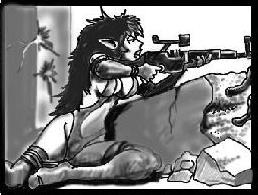 She was roaring into the commlink as her ships weapons opened fire. The first strafing run was deadly as she planned hitting the nearest ship causing it to flip suddenly and go burning straight down slamming into the farthest ship tearing off most of it’s left wing. The damaged ship rolled right and down to a large scrap yard for spacecraft. The bounty hunter was a good pilot it seemed. He was able to crash the ship in a vast open area at the far side of the field. The pilot fell out of the smashed craft and started running across the open field. The Blood Claw lightly touched down next to the bounty hunters smashed ship. Lionette sprang from the cockpit landing in a crouch. She saw the terrified man running across the ground ahead of her. Her hunting instincts were now in full charge of her senses. She could smell his sweat and hear his breathing. “Stop!” Yelled a security officer as he and two others ran toward her. Lionette grinned at them as she began her chase of the bounty hunter. “Stop or we’ll shoot!” the officers were still in pursuit. Lionette was on all fours running now, her heart pumping blood to every muscle in her body, the chase was life. Feloids were born to hunt. She was easily out distancing the officers and closing on the bounty hunter. A shot came from behind just missing her. These security officers were taking their jobs seriously to be sure. The bounty hunter turned his head one last time to see how close she was. He was stunned by his last vision. In full leap in mid air was the picture of grace and power. A Feloid princess hunting. He never felt the light saber take his head. The security guards stopped running about fifty meters from Lionette. She was standing with her light saber in one hand and the bounty hunters head in the other starring at them. Lionette realized she didn’t have her rifle; she wouldn’t be able to reach the officers before they could shoot. The first security guards head suddenly turned into a fine pink mist. Nobody that saw it happen new what to make of it. His body dropped to its knees and fell to the right with a thump. The next man had run only two meters before his chest burst in the same pinkish spray and fell on his face. The third looked pleadingly at Lionette hoping she could save him. Lionette just stared into his eyes coldly as a third round struck him in his back. She stood staring at the three dead men. She looked carefully at every possible place he could be. It bothered her that even she had to admit she didn’t know were he had taken his shots from. The princess smiled, in the distance she could see Timtam racing across the field on a swoop bike. How she got it or even learned how to drive one would surely be one of Timtams priceless stories. Timtam jumped off the swoop and ran to Lionette and knelt in front of her. With a huge grin she held up the bracelet to her princess. Lionette inspected it and then had Timtam fasten it around her wrist. “Gladly my mistress.” smiled the pink haired little slave. “I’ll remember my mistress.,” said Timtam as she looked around trying to spot him. “Don’t bother Timtam, he is long gone from here, of that I’m certain.” said Lionette. They had reached the Blood Claw by now and began to get in. They saw a security patrol vehicle pull up and two more officers get out. The two men looked in shock at the four bodies strewn around the area. Lionette stepped down away from the ship and stared at the two as if to say that she was not running away from the place put she did intend to leave. ” Mistress, please, let’s just go.” pleaded Timtam. “Silence! ” Lionette shot back angrily. The two men looked at each other and quickly got back into the vehicle and left as fast as they came. Without even looking at Timtam Lionette said, “Don’t ever do that again.” Timtam was horrified by what she had just done. She had shown doubt in her mistress’s abilities. She thought the two men were a threat to Lionette, the first daughter of Maxis Ty the clan leader. “Forgive me mistress, I was frightened.” She hoped this excuse would keep her out of trouble. ” Forget it Timtam ” Lionette said calmly. She could not expect a slave to have her courage. ” Just get in the ship, and try to stay in it this time.” Timtam smiled, Lionette was not angry at her “Yes my mistress.” she replied as she got in and closed the hatch. The ship lifted gently from the field and gracefully shot skyward. Lionette was silent as she focused on the scanners for any sign of further pursuit. Timtam was still embarrassed by her momentary lack of faith in her mistress. She felt like she should say something to make amends but she new it was too late for that. Lionette had little patients for such things. She quietly climbed into her seat in the gun turret above and behind Lionette’s position in the cockpit. Timtam automatically swung the turret to the rear and put on her headset. She sat with her head down and her hands in her lap with out moving. “Timtam, are you watching our rear or daydreaming?” Lionette’s tone was calm and steady. “Forget it Timtam, I’m not angry at you. You did very well back there.”Lionette was not good at complimenting slaves, but it was different with Timtam. “You were very brave and I’m …proud of you.” Lionette said half mumbling. Timtam sat up straight in the turret.” Did you say proud mistress?” Timtam said holding back her tears. “Don’t you cry Timtam, don’t you make me regret saying it.”Lionette said. “No mistress, I won’t cry.” Timtam said with tears running down her face. It had been the first time in her life a freeborn had given her any compliment ever. The free borns mission is to keep the slaves subjugated and to make sure they new their place in the world. Lionette new this too but gave her a compliment anyway. It most likely would never happen again. Lionette changed the subject as quickly as she could.” With the information we have now we may be able to hide Mykala from the Empire for quite some time. It will be a loss not to have her in combat I must admit.” Lionette said. “A great loss indeed mistress.” Timtam chimed in. She wanted Lionette to know she was listening. She was with Lionette the whole time and listened to her speaking and make plans with the other Feliods that would be helping but she didn’t really understand the plan at all. Timtam didn’t mind because she was only to worry about Lionette’s needs and to take care of them. That was her life and she enjoyed it for the most part. How fortunate she was to belong to a royal house and a clan leader at that. Most of her kind had very hard lives doing the menial jobs or much worse. She thought of Pep and how she must have suffered at the hands of the Human masters she had. Humans are often driven mad by the pheromones catgirls give off. It makes them very aggressive towards the catgirl in ways she dare not think of. Pep was lucky to belong to Matt now; he was a good Human for the most part. Lionette secretly found it disgusting that Pep would voluntarily sleep with a human and didn’t like Timtam befriending Pep. Timtam new that Lionette would never understand why Pep stayed with Matt. Pep was a slave and only had the options a slave is given. Matt was a good choice. All catgirls have a secret language taught to them by other catgirls that consists of hand gestures, eye movements, and body postures. This way they can converse and pass on information to keep each other out of trouble. Timtam and Pep did this all the time and nobody new it. Only once in a while did things get hard on Timtam. This time it was one of the Feloid captains that was not too eager to go along with the plan Lionette had laid out. Lionette had Timtam go to his room that night and help to convince the captain of the rewards he could obtain once he had done his job. She was very good at convincing males to see things Lionettes way. It was just part of her duties to the clan and sometimes it was not a hard thing to do at all if the right male was involved. She had to be careful about not showing Lionette that she enjoyed it too much however. Lionette was not allowed to have a lover. She was a princess and had to remain pure and chaste. One time a suitor that was interested in Lionette would not take no for an answer and insisted on making advances toward Lionette. Lionette wanted him as much as he wanted her but she would disgrace her family if she slept with him. Lionette sent him Timtam to satisfy his needs but when he came back a second time and then a third Lionette broke off the relationship and beat Timtam for doing too good a job. The Blood Claw was now out of the planets atmosphere and headed for deep space. 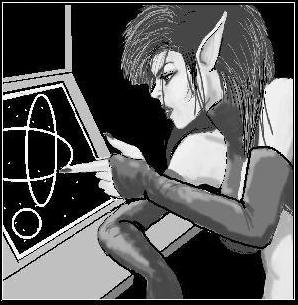 Lionette had moved to the back of the ship to put the flight data into the astrodroid . Timtam turned away and quickly wiped the rest of the tears from her eyes. It was too late because Lionette had already seen her face but just shook her head and rolled her eyes . Timtam always cried at everything. “Timtam would you take the controls for a while ? I want to keep an eye on the long range scanners for a while and make sure all the captains take their ships where they are supposed to.”Lionette explained as she switched on the console. The communications receiver crackled on suddenly. It was a message from one of Lionettes captains in the Dantooine system. She reported that Verilious Thad’s ship had just jumped out of Hyper Space and into Dantooine space. Timtam stared blankly at Lionette. Lionette decided to simplify her description. “In short Timtam, Thad will be exposed as a spy and the Empire will no longer trust him. They also will be worried we will try to get information about Thad and the Empires dealings so they will kill him thus ending our problem. “What about the other captains mistress, can they be trusted?” Timtam asked. “I hand picked the other captains myself so I believe they can be trusted totally.” Lionette answered. “But don’t the other captains have the same information as master Thad?” Timtam said trying hard to follow the complexities of the plan. “Very good Timtam, yes they do but after Thad gives the Empire the wrong information I will send messengers to the other captains with the real plan. ”Lionette was determined to have Timtam understand what they were doing. “Oh I see, You mean to trick master Thad into betraying himself.” Timtam responded. “That is a very clever plan mistress.”Timtam added smiling. Lionette smiled back.”I’m so very glad you approve Timtam. Timtam turned to look out of the cockpit window. The ship was on auto pilot and with the astrodroid assisting, the ship could fly anywhere all by it’s self. “Timtam, I am going to rest for a while would you get the bed ready?” Lionette was already taking off her clothes. “Yes mistress.” Timtam said as she clambered into the back of the ship. The ship was small but well laid out. It even had a shower and small kitchen area. The Blood Claw had enough room to transport at least six human sized occupants. Lionette was in the shower ,she hated being dirty for any amount of time and after the fight they had just been in she needed one she thought. Timtam loved space travel. She especially liked being alone with Lionette in the Blood Claw on these trips. It gave them a chance to talk and laugh. Lionette didn’t laugh that often. She was always thinking of her responsibilities. In some ways she was as much a slave as Timtam. She was told who she had to marry and how to act. She always had to be the princess and never was able to just be herself. There were times Timtam almost thought of her as an older sister. In their society however everyone had a role to fill and everyone expected everyone to do their part. Out in space it was just the two of them and for a short while they could just be themselves. Timtam pulled the bed out from the concealed compartment and tightened the supports then laid out the blankets. Lionette was in the small shower compartment washing off the days filth from battle. Timtam went to the largest compartment to get Lionettes towel and hair brush so they would be ready for her mistress when she was done. Timtam was puzzled when she opened the compartment, the only thing she saw inside was a large human male. He handed her a towel. Before she could scream he was out and had his hand over her mouth. He pressed a blaster to Timtam’s head and gave her a hard stare that she took as him wanting her to be silent. 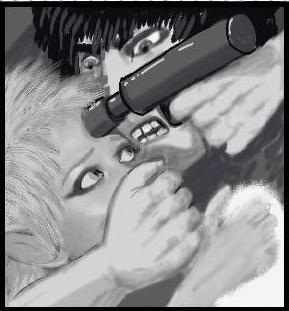 Timtam could barely nod as he was holding his thick meaty hand clenched over her tiny mouth and the gun pressed against her head so tightly. “Timtam,hand me my towel.” Said Lionette as she reached out of the shower. The man motioned for Timtam to do so. Timtam took the towel and handed it to Lionette in a way that she had to lean over to see Timtam. Lionette looked at Timtam. She saw Timtam’s forehead had a strange circular mark on it. Lionette quickly grabbed Timtam’s wrist and pulled her as tightly as she could to her. Lionette wanted to pull her inside the shower with her but since there was no room this would have to do. ”Emergency order five zero four!” Lionette yelled too the astrodroid. The droid responded with a few clicks and a beep or two and opened the rear hatch. Lionette was holding Timtam as hard as she could. As soon as Timtam heard the order given she grabbed onto Lionettes arm and froze waiting for the bounty hunter to begin shooting. Lionette looped her other arm through a grab handle in the shower wall. Lionette took a deep breathe for her next action. The bounty hunter was taken by complete surprise and never stood a chance. He was sucked out the rear hatch almost before it was fully opened. He never even had a chance to scream. Timtam tried to scream but all the air in her lungs was sucked out as soon as she opened her mouth. Lionette saw Timtams eyes roll back and felt her hand go limp. “Emergency order five zero four rescind, execute!” Lionette yelled with the last bit of air from her lungs. The astrodroid quickly closed the back hatch. Timtam fell to the floor lifeless. Lionette stumbled soaking wet from the shower and immediately began the give Timtam mouth to mouth resuscitation. Timtam didn’t respond. Lionette kept at it until Timtam coughed and took a breathe on her own. Lionette sat back and watched as Timtam lay there and slowly began to breathe normally. . Lionette had nearly lost her several times that day. Timtam was the most loyal person she new and always put Lionette first time and time again. It was a shame she was a slave and could not be rewarded in some way. Timtam felt around on the floor and grabbed the towel and handed it to Lionette. “Your towel mistress.” Said Timtam in a half dazed state. Lionette took the towel. “Thank you Timtam.” Said Lionette and she started to laugh.” What is it mistress ? “said Timtam as she looked around to see what Lionette was laughing about. Lionette just leaned her head back and laughed harder. Timtam sat up and looked around the floor. “I think I lost your hair brush mistress. ”Timtam said still wondering what was so funny. Lionette was in hysterics at this point and gave Timtam a big hug, what a joy she could be. Lionette wiped the tears of laughter from her eyes and sighed. “What would I ever do without you Timtam?” Lionette said looking into Timtam’s eyes. “I don’t understand mistress.” Timtam answered not quite sure what Lionette meant. “It doesn’t matter Timtam. It really doesn’t.” Lionette stroked Timtam’s hair. “Now go take your shower and I’ll straighten up.” Said lionette. “No mistress, I should do that.” Timtam protested. “In!” Lionette said pointing at the shower and then smiling at her little slave. Without any further argument Timtam stripped and got in the shower. Lionette was amused at how child like Timtam could be. Lionette still wet, went to the cockpit and put the ship into hyperdrive. The ship rush forward at unimaginable speed but in the ship there was no feeling of movement at all. Such is the way with space travel. The laws of physics are bent and twisted and most people can barely understand the way it works but they hurtle themselves into the void anyway. Lionette had dried herself and was in the bed. Timtam was out of the shower and drying just finishing drying off. “It’s a long flight back to Feloid space so come to bed. Timtam got down on her knees in front of the bed. “You saved my life just then mistress, I mean with me passing out because of the airlock didn’t you?” asked Timtam looking down. “What of it, You would have done the same for me wouldn’t you?” Lionette responded. Timtam just nodded in the affirmative still looking down. “Then that will be the end of it.” Lionette said. “Thank you mistress.” Said Timtam quietly. Timtam pulled her sleeping mattress out and laid it on the floor and curled up on it just below Lionettes bed. The two drifted off to sleep in the Blood Claw’s cabin. The vessel flew threw space and time getting closer to home every millisecond. The plan to hide Mykala from the Empire had begun. The struggle for freedom in the galaxy would some day be over but that was a long way off. For now it was enough to sleep and rest. To be fresh to continue the struggle another day.